While I'm talking to all of you that have been featured on this little old blog, with your eye for detail and no fear of color, today I'm hauling Melinda of Hobo Chic to the front of the class and making an example of HER!! Just look what she did! She started with this desk right here. Back to Star Of The Day Melinda...after painting, she applied two coats of polycrylic and then dark wax. 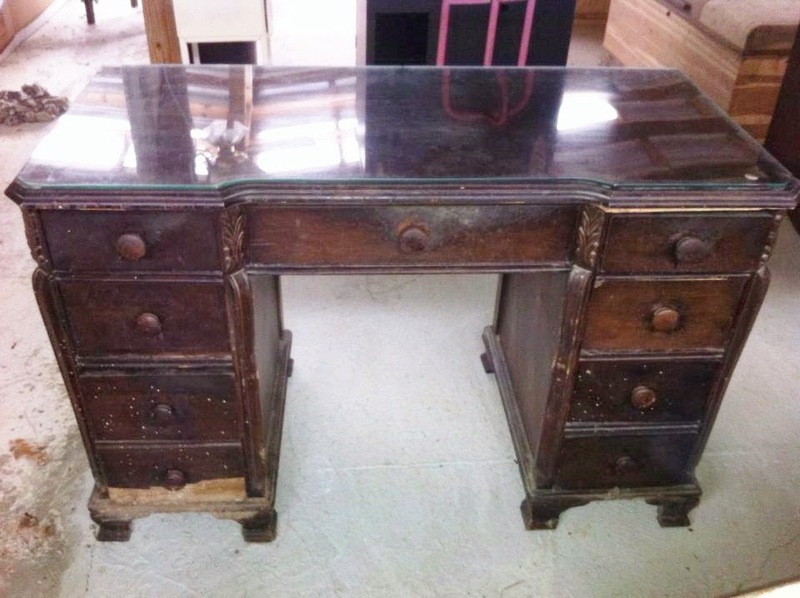 She then added appliques to the drawers and to the front of the desk. She painted them black and then went over them with aged silver. The knobs were given to her by a friend and they set it off beautifully. Melinda wasn't ready to call this complete because how can you have a desk without a chair to sit on? She went back to that same country store and found a chair to redo. She painted it to match and recovered the seat in this beautiful fabric. It compliments the desk perfectly. Will you look at that!?! NOW, do you see why Melinda has been standing up here for so long as I rambled about ice cream? She deserves it for showing me up again!! Aye Yai Yai!! Look at the details now eagle eye! Those appliques look like they were MADE to go with that desk. They look like they were there forever. 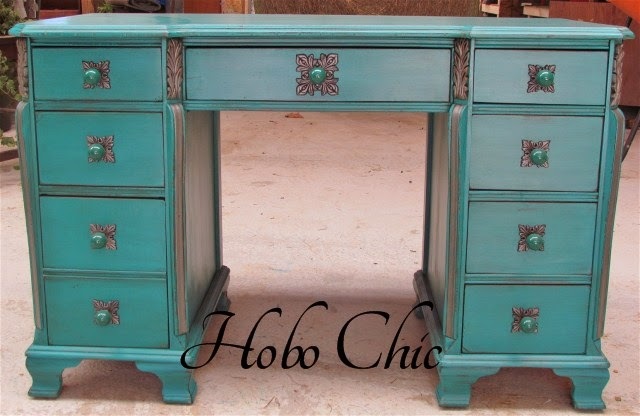 Hobo Chic is based in Mississippi and she sells her items at the Southwest Vendors Mall in Summit, MS, although this desk never made it there. Why not? Because pretty much as soon as she shared the picture online after it was finished it SOLD! You might recall when I featured an awesome hutch Melinda did back a few months ago. You can follow along with the adventures of Melinda and Hobo Chic on her Hobo Chic Facebook page. Get over there and let her know you saw her on Furniture Flippin'. Thanks so much Melinda for sharing your spectacular furniture flip! 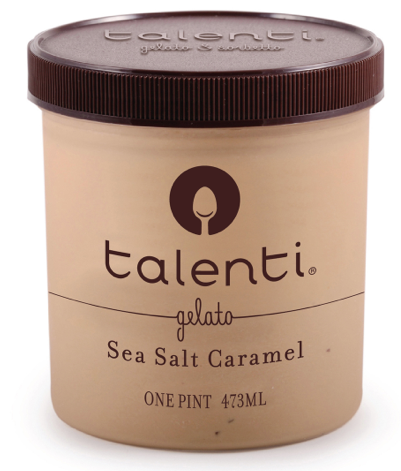 Oh, Talenti Gelatto did not pay me to brag up their stuff. I just love it. If you work for them, can you hook a girl up? The Sea Salt Caramel is my favorite. Wink, wink. The rest of you! Don't forget...this blog is currently accepting your witty comments. So get a typing! Dull ones are welcome, too, not that I've found a dull one on here yet. Looks great coming and going! I agree with Diane...looks great coming and going. Creative! Inspiring! Makes me want to run out and find a desk, or maybe I should just pull out a piece from the storage instead. Thanks so much for this blog as it helps us collectors of items to redo to start doing. So, so inspiring. 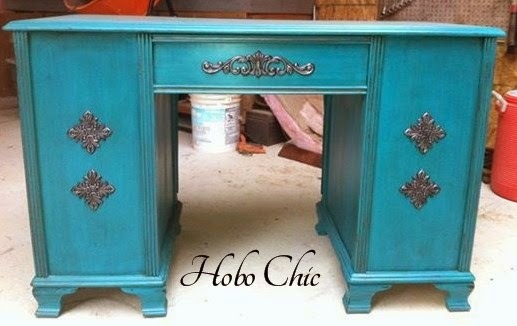 i love this turquoise color used! I want to find a way to incorporate it into my home! I always read the words as they describe the beauty of the finished product love your site! thanks so much for featuring my work. I always enjoy reading the stories you write to go with the pictures. You went back to the witty line for seconds! !